We drove to Olmstead Point with permits in hand feeling excited and tired. We had already hiked 15 miles today, and in a few short hours we would hike another 16 miles. Around 8pm we made our way to the Happy Isles trail head parking lot. With the windows cracked open slightly for ventilation, we tried to sleep. Laurie – being the champion sleeper that she is – was out like a light in 10 minutes. But with a steering wheel between my legs and constantly worrying about rangers patrolling the parking lot I had a difficult time turning off my brain. With cars constantly entering and leaving the parking lot, and the rangers checking for people sleeping in their cars every half hour, I didn’t sleep even for a moment. By 10:30pm I’d had it. Laurie woke up yet again from my fidgeting and we decided to get our gear together and start hiking. We were on the trail by 11:30, feeling wired with excitement. The critters really do come out at night. 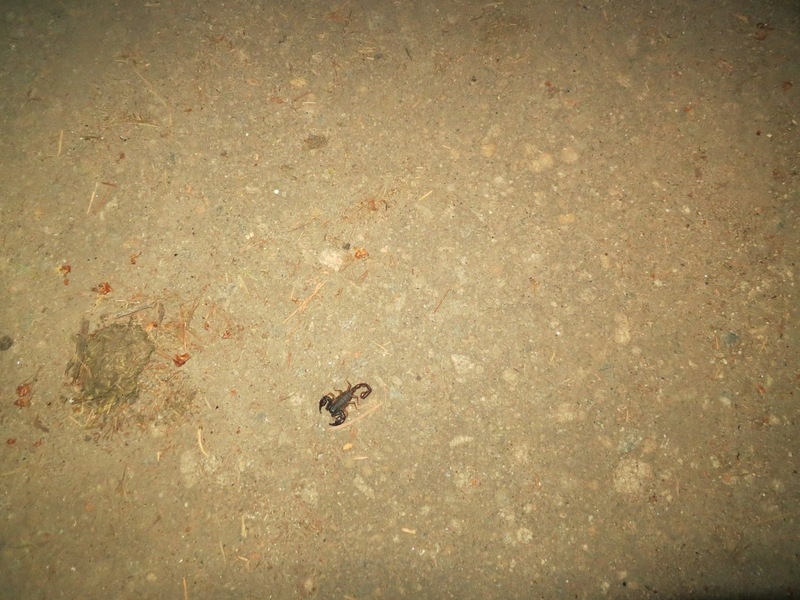 I saw many insects I never do during the day – like this scorpion. 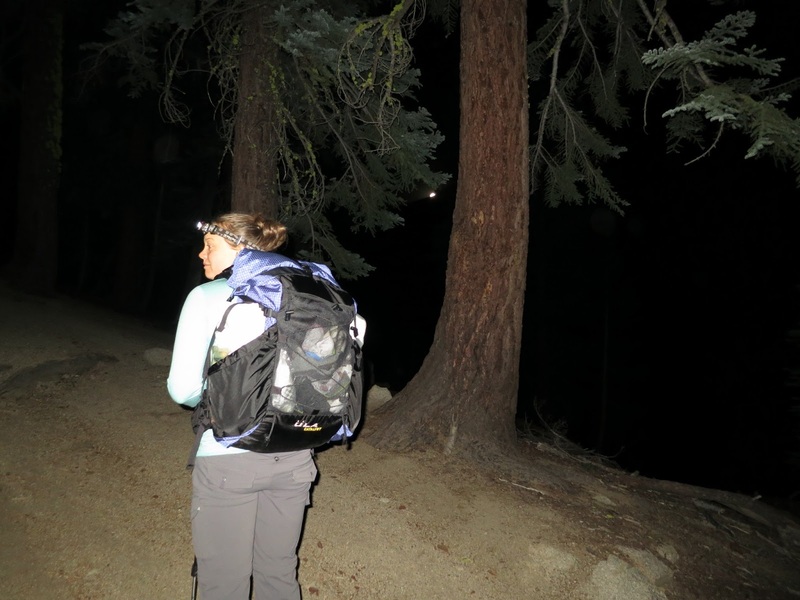 We turned right onto the John Muir Trail and soon realized that although there was a full moon out tonight, it wasn’t going to light our way. We would need our headlamps. The first few miles came easy. We enjoyed walking in solitude, hearing only our breaths as we climbed. The temperature was wonderful too. Upper 60s to low 70s. Half way up the switchbacks on the JMT I began to feel really tired. I could have taken off my pack and napped on the trail. But instead, I ate a bar (or two) and kept walking. Laurie was feeling great and enjoying herself too. 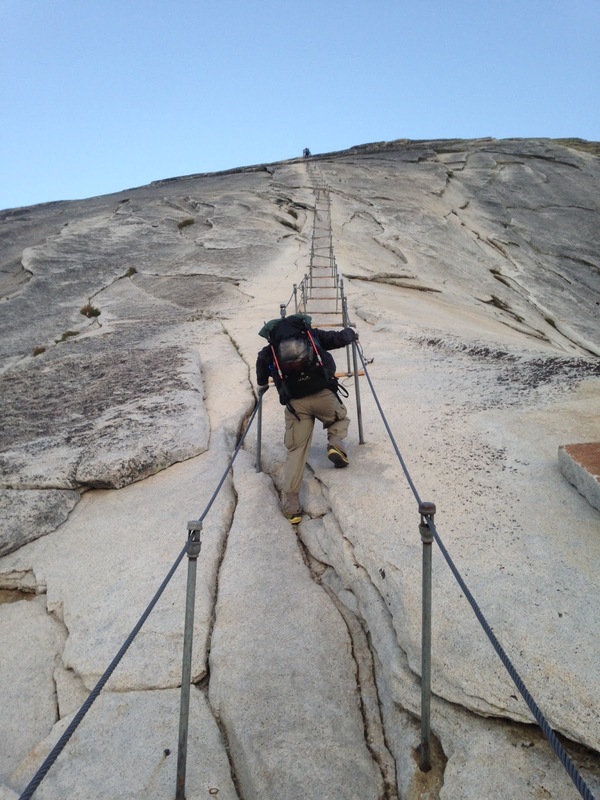 Around 2am we reached the bridge near the intersection of the JMT and the Mist Trail. 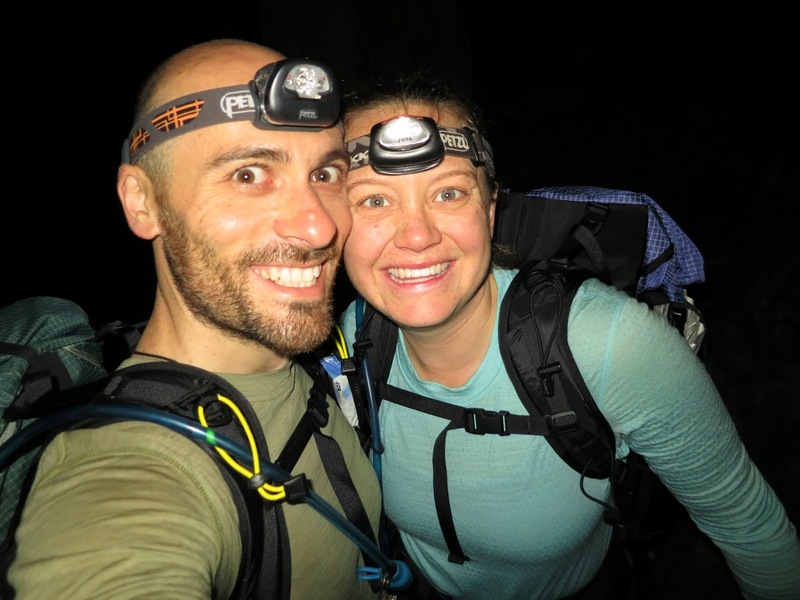 Feeling good and with the moon finally above us, we enjoyed a few miles of headlamp free hiking. 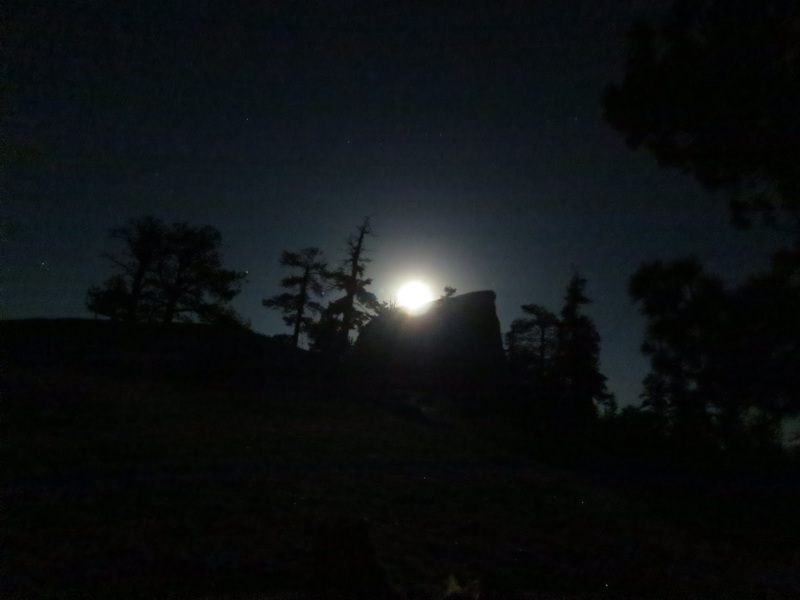 Once in tree cover again, we turned on our headlamps as we turned left towards Half Dome at the trail junction. 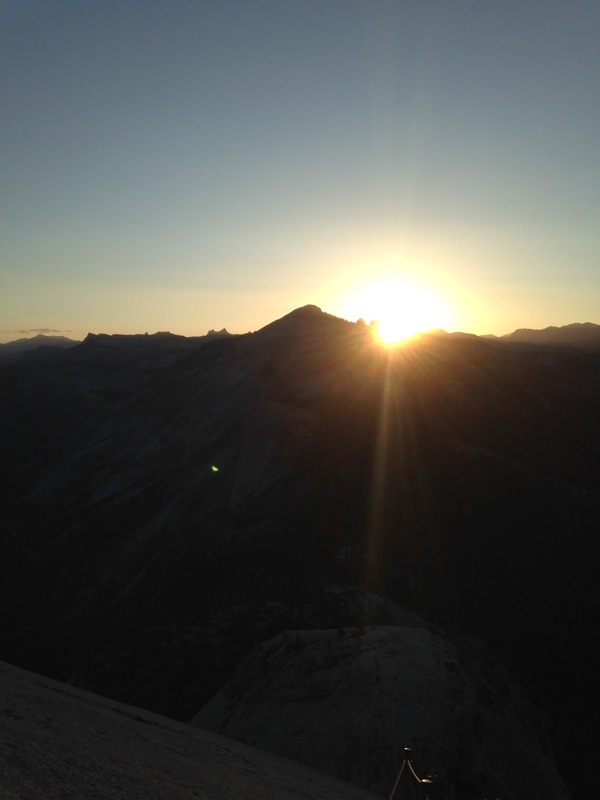 Around 4:30am we neared the base of Sub Dome. We were tired and wanted to wait for day break before heading up, so we took a 30 minute nap. We found flat ground to the left of the trail and laid out our deflated air pads on top of our Tyvek ground sheet. 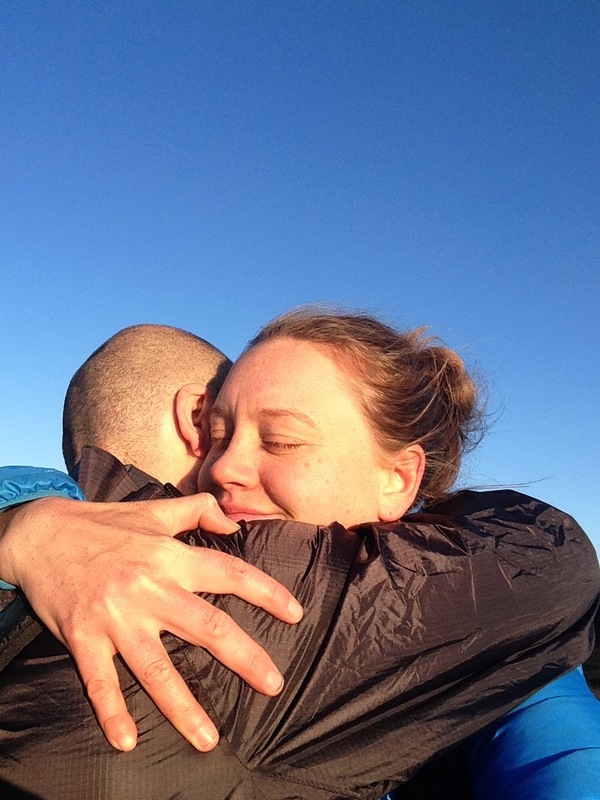 With our dirty, sweaty hiking clothes we got into our sleeping bags and were fast asleep. Laurie’s alarm woke her up. But I didn’t hear it. When Laurie woke me up, I had no idea where I was and what I was doing. Feeling cold, Laurie threatened to leave without me if I didn’t get up asap. After coming to, I got up, packed up and we were on the trail 5 minutes later. We reached the cables as day broke. Another spectacular day in Yosemite was upon us. 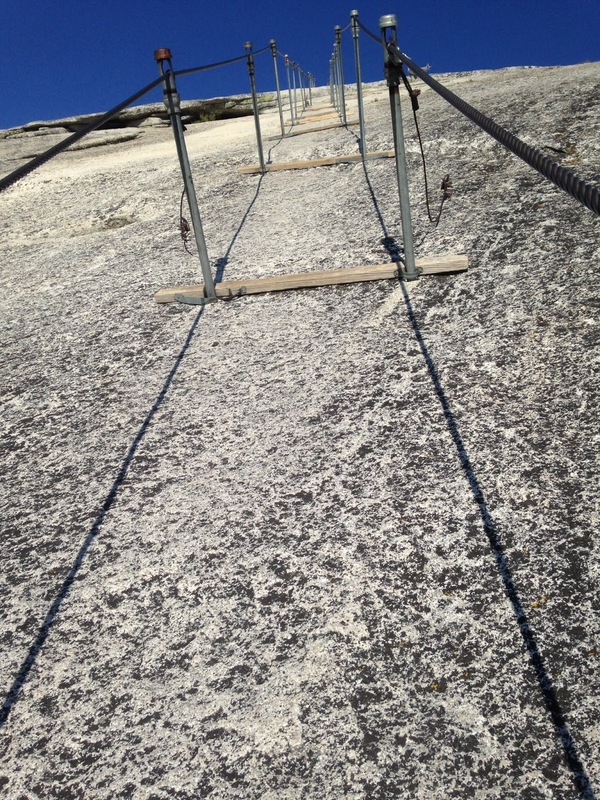 I’ve hiked Half Dome twice before and I still got the butterflies standing there gazing up the cables. This piece of granite scares me. The cables scare me. The exposure scares me. The height scares me. But I still do it. I love taking deep breaths, telling myself I can do this, and then doing it! 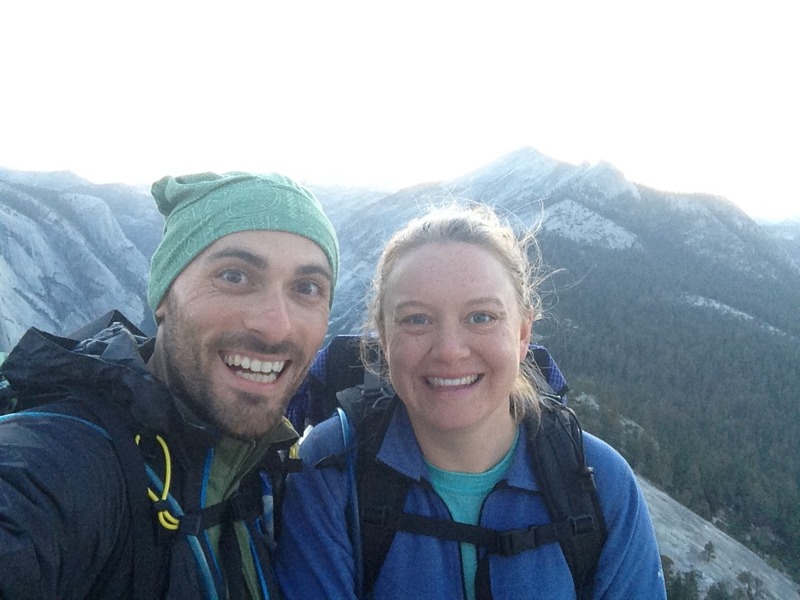 Laurie had hiked Half Dome three times before – two of those being night hikes. Half Dome does not scare her. 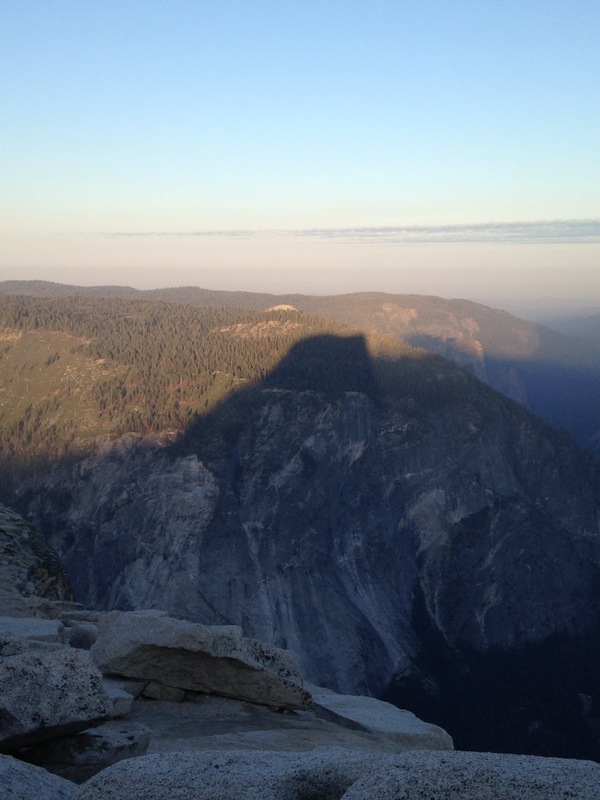 The bright orange sun and the claps of three women greeted us at the top of Half Dome. My forearms were burning and I was panting, but I didn’t care. I had overcome my fears once again. An hour and a half later we were ready to head down. 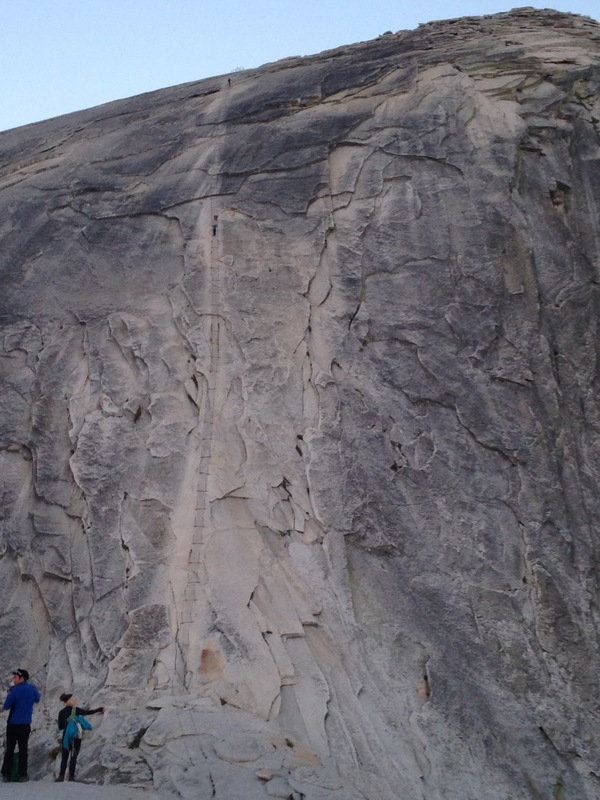 I went first, facing Half Dome. For whatever reason, I feel more comfortable hiking down with my back toward Sub Dome. Laurie had lots of time to wait as I slowly made my way down and took a few photos capturing the steepness of the cables in some sections. 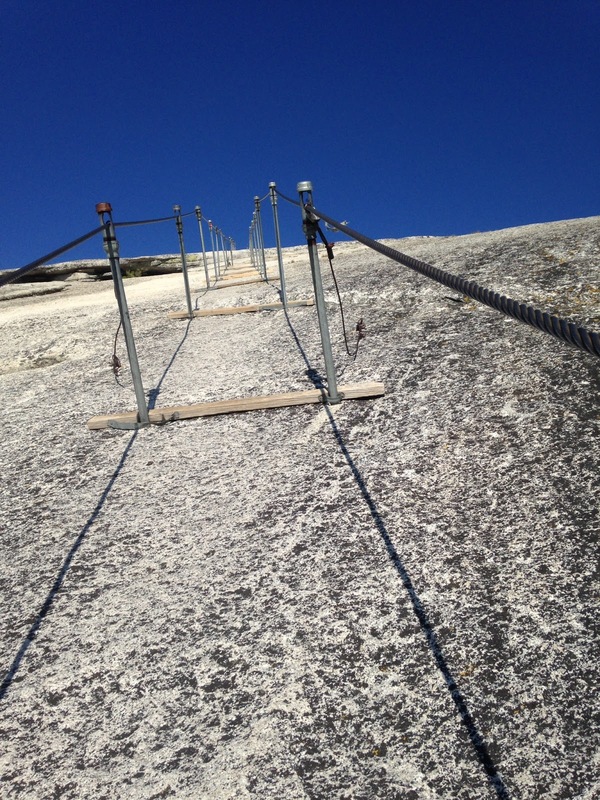 I can’t believe some people hike this rock when the cables are down. We passed many, many day hikers headed up as we made our way down the trail. 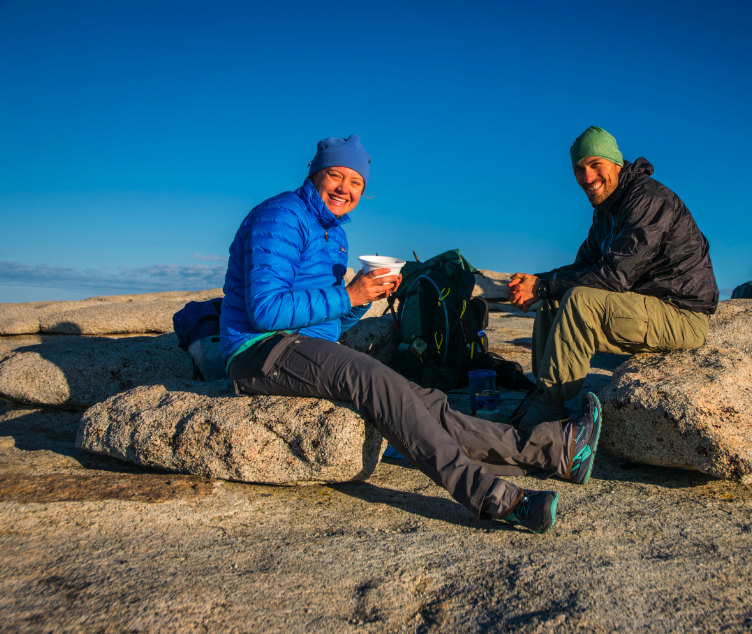 The John Muir Trail was the route of choice on our descent as well because of the gentle grade compared to the Mist Trail – which is shorter but steeper. The waterfalls are beautiful and we recommend the Mist Trail if you’ve never hiked it before, but we chose to save the pounding on our knees. 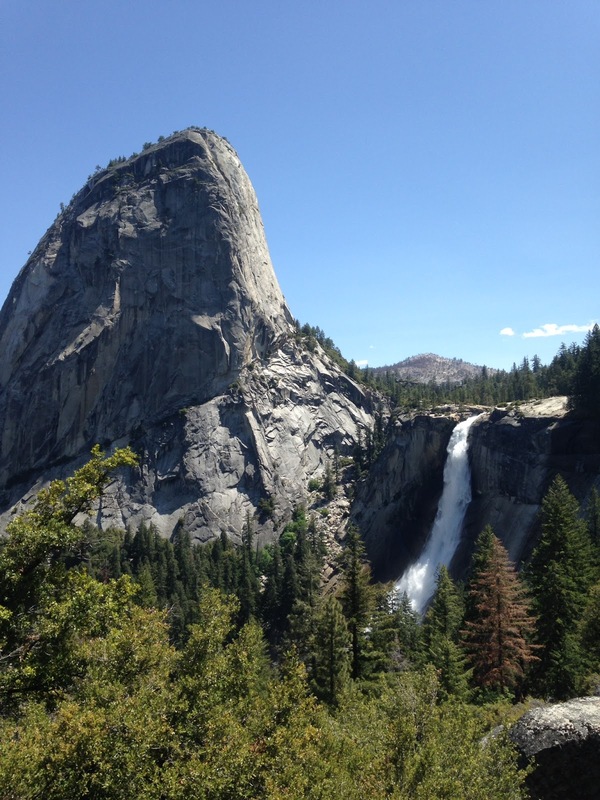 After a quick break to enjoy the views of spectacular Nevada Fall from the JMT, we continued down the trail. We were exhausted by the time we made it back to the car. After changing into cotton t-shirts and flip flops, we went to Curry Village for the most disappointing burgers we’ve had. The chips and hummus though were delicious! Eager to beat the Bay Area traffic, we hit the road shortly after. But we were really tired. A few miles past the 1,000 Trails campground junction, I pulled over on Highway 120 and we napped for 20 or 30 minutes before continuing on. 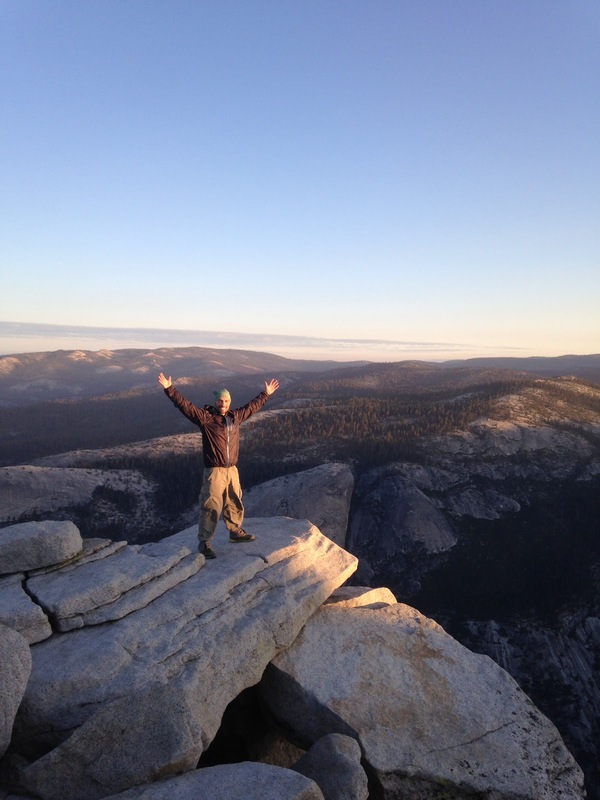 We love playing in Yosemite and look forward to returning soon – maybe for some winter activities…if we get any snow.